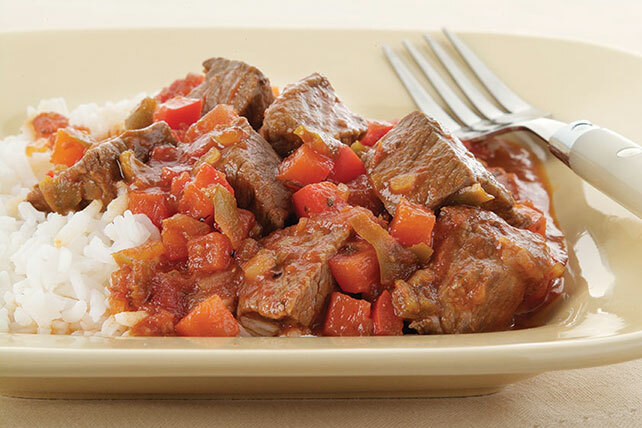 Want to know the flavorful secrets to this beef stew's amazing taste? Think chunky salsa, red wine vinegar and salad dressing mix. Mix vinegar and dressing mix until well blended. Pour over meat in medium bowl; stir to coat. Cover. Refrigerate 20 min. Add meat and peppers to hot oil in medium saucepan. Cook on medium-high heat 5 min., stirring frequently. Add salsa and broth; mix well. Bring to boil. Reduce heat to medium; simmer 20 min. or until meat is cooked through and stew is thickened, stirring occasionally. Serve with hot cooked rice, if desired. For a fun serving bowl, cut a circle from top of 4-lb. pumpkin, about 3 inches from stem, to form a lid. Clean out inside of pumpkin; discard pulp and seeds. Replace lid. Rub outside of pumpkin with oil. Bake at 375°F for 50 minutes or until flesh is tender but outside is still firm. Fill with hot stew just before serving.